The second game released in the Mario Artist series. The aim is to create your own characters and place them into short films that you can share over the Randnet DD service. 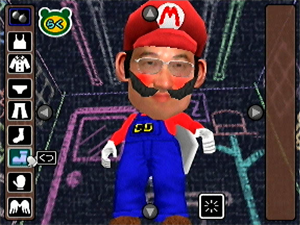 Create polygonal characters using the editing features, and insert yourself into the game by taking a picture of your face using a digital camera or even the Game Boy Camera. You can change a character's colour, shape and outfit. You can alter aspects of the films you create as well. The game comes packaged with a microphone that lets you record your own voice over. One of the songs you can play over your creations in Talent Studio is Kazumi Totaka's Song, a short tune that the Nintendo composer has hidden in nearly every game he has worked on. One of the preloaded videos in the game is a speedy driver hurtling towards an old man crossing the road slowly. In the scenes with the old man, Kazumi Totaka's Song is heard. To find out about all appearances of the song, see the Kazumi Totaka's Song Guide.